Let’s start with how you created the stage, CLAMP Campus, for the three series depicted here. Ohkawa: Nowadays we all work together on creating a story, but back in our doujinshi days we would each come up with our own stories and characters. One day we created a common setting and had our characters live there, which let all our characters interact with one another’s. For example, Igarashi’s characters would show up in Nekoi’s stories. That common setting was CLAMP Campus. The campus appeared in many of our first stories because we loved it so much, and also because it was easy to use. Does this mean that the members of the detective team originated from your doujinshi days? Ohkawa: Nokoru originally came from the setting “Imonoyama-ke”, but we later pulled him into the CLAMP Campus. He was one of the first characters we made in our doujinshi days. Suoh appeared in Hagunsei Senki (Records of Hangunsei War), a story based on Hakkeden (Legend of the Dog Warriors). 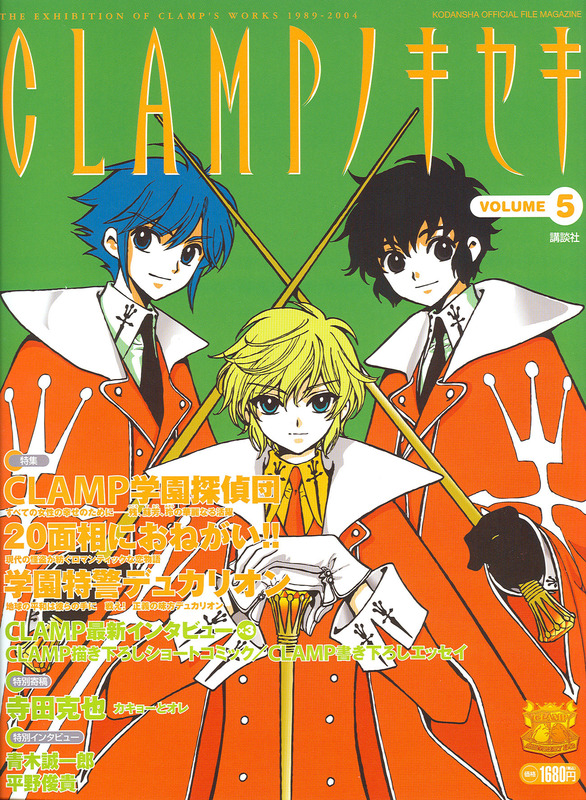 It wasn’t a doujinshi— Comics Box-san published a few chapters, and the setting for that was, of course, CLAMP Campus. Nagisa-chan actually appears in it too, as one of the enemies. Akira first appeared in 20 Mensou ni Onegai!!. We let ourselves show their school lives, which we couldn’t before. Which was the easiest character to transfer? Ohkawa: Suoh was surprisingly easy. Nokoru was in danger of becoming too perfect and to keep him from being excessively bright we were going to dumb him down a bit. But when we tried that out we didn’t like it at all, and instead took care so that he wouldn’t be annoying. That’s why he is so bad at sports. If a character can do this and that, they become boring. Is there any reason why the Detectives’ clients are all female? Ohkawa: It’s a habit of mine. I didn’t realize it at the time, but just about all the clients I write about are female. This happens in CLAMP Gakuen Tanteidan and for most of Tokyo Babylon. I’m aware of it now, but even so, I keep on doing it in our current series XXXHOLiC. It’s not because the Detectives are chivalrous? Where did you have difficulties? Ohkawa: …..I couldn’t come up with tricks. *laughs* That was the hardest part. Igarashi: In CLAMP Gakuen Tanteidan there aren’t many cases that can be understood through logical-type logic. In File 1 and File 3, the conclusion is solved through The Amazing Powers of Nokoru’s Financial Wealth. *laughs* In File 6 and File 8 the mysteries weren’t all that mysterious. A lot of the other files are heart-warming stories about campus life. I think the only truly mysterious one was File 5. The chapter sub-titles are all quotes from movies. Why…? Ohkawa: Because I love movies so much. Did you come up with the chapter’s story based on its movie sub-title? Ohkawa: No, it was the opposite. I’d come up with a story, and then I looked for a title that matched. Silk Stockings was the one exception. That one I picked out the title first, then came up with the story. A lot of the color illustrations in CLAMP Gakuen Tanteidan bear no direct relationship to that chapter’s story. Mokona: We did that with with movie posters in mind. Because we were using sub-titles from movies, instead of basing the illustration on the story’s contents we drew in the style of movie posters– using imaginary movies. The magazines it ran in, ASUKA and Mystery DX, usually have color chapter covers. With that, and the drawings we had to make for the videos and LDs, CLAMP Gakuen Tanteidan ended up with a lot of illustrations despite having few manga volumes. Do you have any lasting impressions from your readers’ reactions? 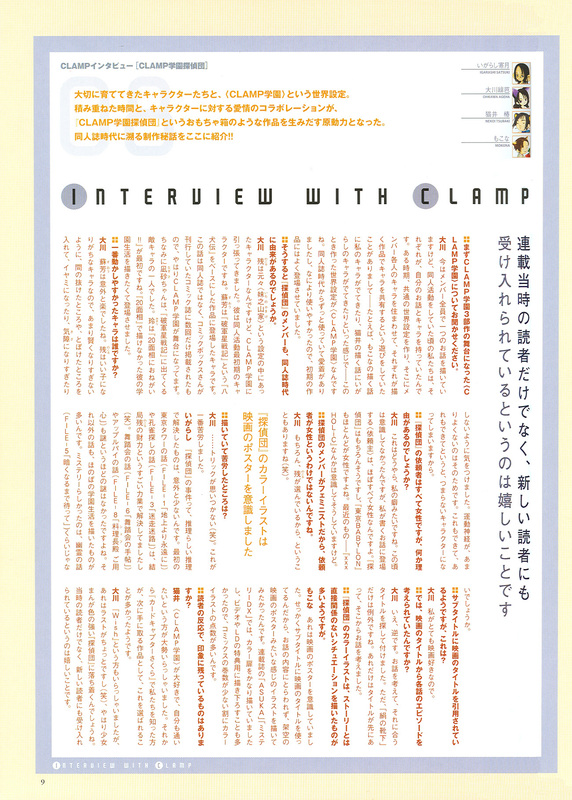 Nekoi: There were a lot of people who loved the CLAMP Campus so much they wanted to study there themselves. Also, it seems that amongst the people we know that CLAMP Gakuen Tanteidan is, after Card Captor Sakura, the series most of them say they decided to get. Ohkawa: A lot of them say it’s Wish, but that’s because the ending is sort of… *laughs* I suppose they feel comfortable with the shoujo manga’s strong sense of color. I’m glad that not just our old readers, but new readers as well enjoy the series. The kanji has it so that “Imonoyama” is a family name and “ke” refers to clan/house. But phonetically it is is identical to “a mountain of sweet potatoes”. Hagunsei Senki　破軍星戦記 (Record of Hangusei War): According to my dictionary, “Hagunsei” is part of the Major Ursa constellation. It further explains that though it doesn’t have the shape of a sword, in Onmyoudou (as in Onmyouji- think mysticism, or Japanese astrology) it is considered ominious to be in the direction that the sword points at. Hakkeden (Legend of the Dog Warriors): Literally “Legend of the 8 Dogs”, it’s a traditional Japanese story. Wikipedia Japan tells me that it’s a story of 106 volumes written by Nansou Satomi from 1814-1842. By memory of Modern Japanese Literature class insists that in the story a princess was impregnated by a dog(god?) and gave birth to 108 dog-warriors. I, I hope my memory is wrong.